Self contained studio apartment located in a modern building with a City Centre location near to transport links and amenities. The property is a self-contained studio flat located in a purpose built block in the heart of Southampton City Centre. 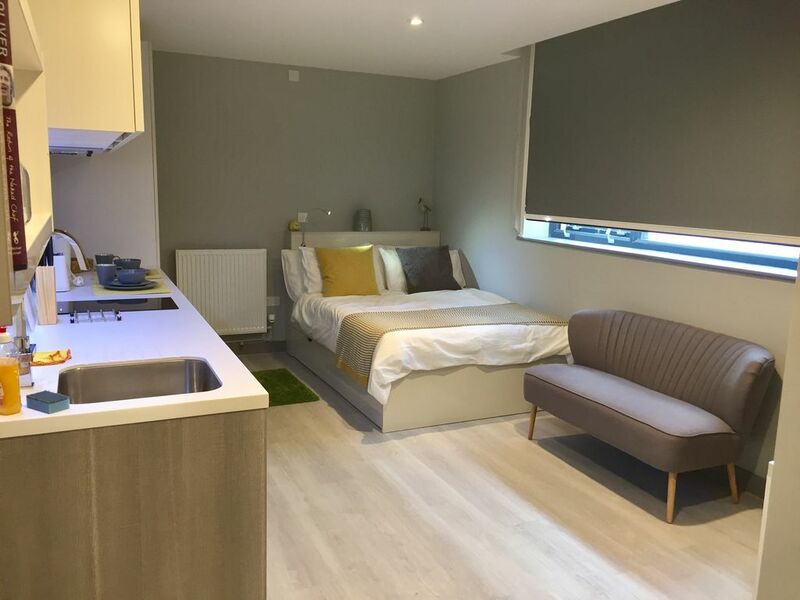 Within the flat there is a double bed, kitchen and en-suite bathroom as well as a desk for work or study. Guests will also have use of various communal areas within the building including gym, laundry room and cinema room, among others. The apartment is ideal for a single occupant or couple but would not be suitable for children. Free Wi-Fi. Guests will have their own self contained studio apartment with en-suite bathroom and kitchen facilities. They will also have use of the communal facilities within the building including a gym, laundry room and cinema room, among others. Please note that the photos above are of an example apartment, each room varies slightly in size and layout. Soft furnishings may also vary to those pictured. If there is anything you specifically require we would advise asking before booking. We regret that children and infants are not permitted to stay in this property. It is a very quite and nice place. We did enjoy our stay at this apartment. Near to the port and city centre.